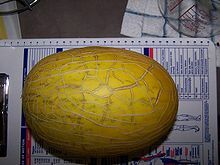 The Hami melon (Chinese: 哈密瓜; pinyin: Hāmì guā) is a type of muskmelon, originally from Hami, Xinjiang. It is also referred to as the Chinese Hami melon or the snow melon. The outer color is generally white through pink or yellow through green. The inside flesh is sweet and crisp. More than 100 cultivated forms and hybrids of the 'Hami' melon have been grown in China. 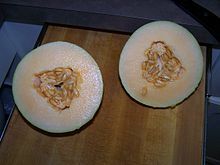 In Mandarin, Hami gua can also be used to refer to cantaloupe. ^ Lim, T.K. (2012). "Cucumis melo L. (Reticulatus Group) 'Hami melon'". Edible Medicinal And Non-Medicinal Plants. Springer Netherlands. pp. 231–234. doi:10.1007/978-94-007-1764-0_36. ISBN 978-94-007-1763-3. Anderson, Eugene N. (1990). The Food of China. New Haven: Yale University Press. pp. 80, 162, 209. ISBN 978-0300047394. This page was last edited on 15 November 2018, at 02:05 (UTC).